If you love homemade skincare products, this guide will help you get set up with packaging to store your creations. I love keeping my skincare simple, so my collection is a three step daily routine, and a three step weekly routine. Need recipes? 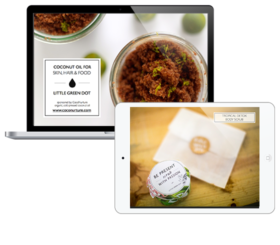 Check out my online school SIMPLIFY Skin to learn how to create your own collection of beautiful, simple skincare at home. Let’s talk about the type of bottles you’ll need, which products they’re best for, and which color bottle you might prefer. Aesthetically, clear glass is a good choice if you like seeing the contents inside, especially if you’re infusing beautiful herbs. Just make sure that you care for your product by keeping it out of direct sunlight. If you choose clear glass, store your skincare in a dark cabinet. To help your product last longer, dark glass bottles are a good choice, especially for recipes that have essential oils or unrefined plant oils. Dark bottles block out sunlight and uv rays, which can damage your product. Dark amber is considered most effective, followed by cobalt blue… but the difference is very minimal, considering that your product is stored indoors anyway. Choose the color of bottle that you find most appealing. If you’re going to keep your bottles out on your bathroom counter, pick the color that you LOVE the look of. Ultraviolet Glass bottles are becoming a popular choice for natural skincare brands, and at home, we can use these bottles to preserve our products too. They are made of ultraviolet glass with airtight lids, which is very effective at blocking out all uv light. This really helps prevent your product from degrading. Ultraviolet glass is significantly more expensive than amber or cobalt blue. But, with natural skincare, it’s all about freshness, and ultraviolet might be good option to consider. Personally, I love the look aesthetically of black glass bottles – I invested in a set and have been really enjoying it! I hope this guide helps you create DIY skincare that you enjoy making and using. Get started by making a perfectly gorgeous recipe for Autumn: my Autumn Body Glow Shower Oil. You’ll find the recipe in our free SIMPLIFY Skin Autumn Starter Kit. I recommend that you store your Body Glow Oil in a Pump Bottle. Clear glass would be beautiful, to see all the autumn spices infusing inside. I’m looking for 10mL amber glass vials with rollerball attachments? Will you have any idea where to get those? That said, the infinity bottles look so nice! Do you ship to SG since you’re not based here anymore? Hi Cherlyn! Happy New Year! Hi Cherlyn, I found a store in Malaysia that offers the 10ml amber glass vials (https://www.glassbottlesmalaysia.com/collections/roll-on-glass-bottles) it’s not amber but you could get in touch with them. Good luck! Hi please answer me if pump bottkes without a lid/cap are air tight? Like the ones you gave pictures of. Can air get inside them? Can I preserve aloe vera gel inside them? If its fresh aloe gel, I would still keep it in the fridge to lengthen the shelf life.